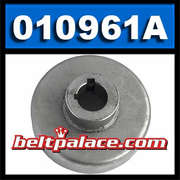 Comet 010961A Brake Drum with External Hub. 1" Bore, 4.2" Diameter, Keyed. Set Screws not included. ONE LEFT IN STOCK. ORDER NOW! Supersedes Comet Part 10961A, B/D W/HUB 4 X 1IN B.